and Alice should climb it. 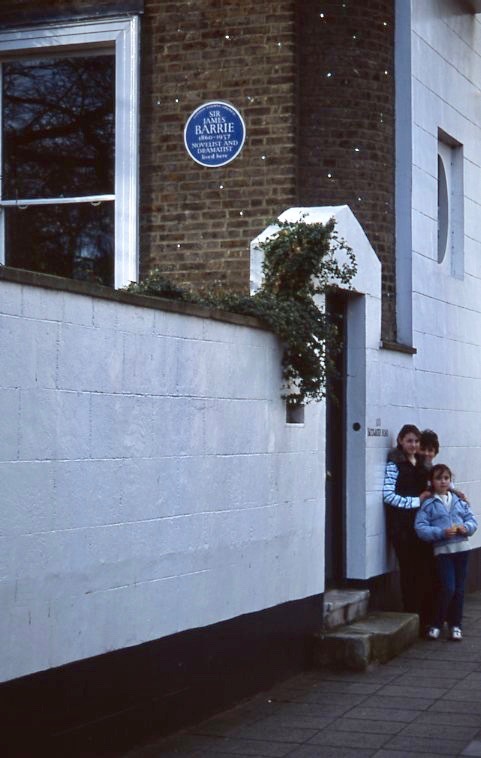 she stood with her brother and sister beside No.100 Bayswater Road with its blue plaque recording J.M. Barrie’s residence there. 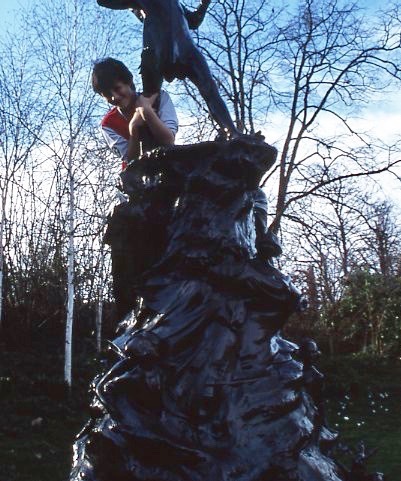 James Matthew Barrie, a Scottish author, was the creator of Peter Pan. There is much available information on the internet. I have chosen a link to the Encyclopaedia Britannica site. 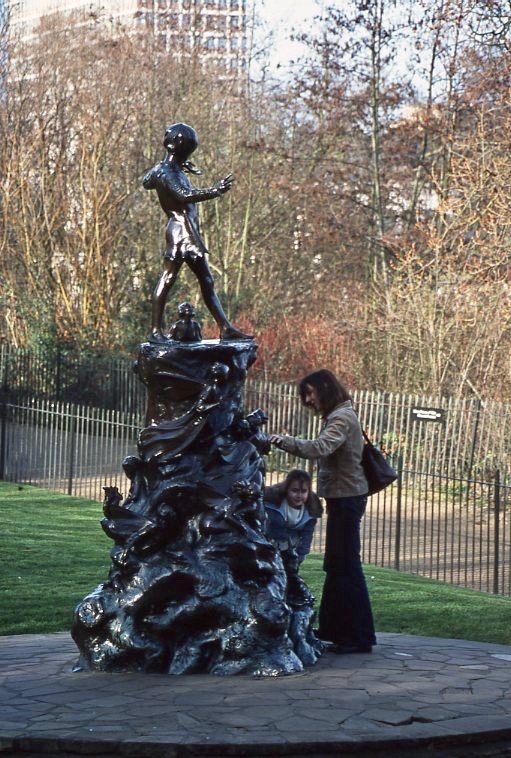 ‘Celebrating Kensington Garden’s famous fictional resident, the bronze statue features Peter Pan surrounded by squirrels, rabbits, mice and fairies. The afternoon we enjoyed a visit from Margery and Paul. We had a good and entertaining catch-up. I have always thought that Jackie’s splendidly spicy Spanish omelette was the real thing. This evening I learned that it is not. Apparently the genuine article merely contains potatoes and onions. Jackie’s however, contains no potatoes. But it is stuffed with peppers, onions, mushrooms, garlic, and whatever else takes her fancy. This evening it was served with sautéed potatoes and five varieties of baked bean. The Culinary Queen drank Hoegaarden and I drank more of the Merlot. 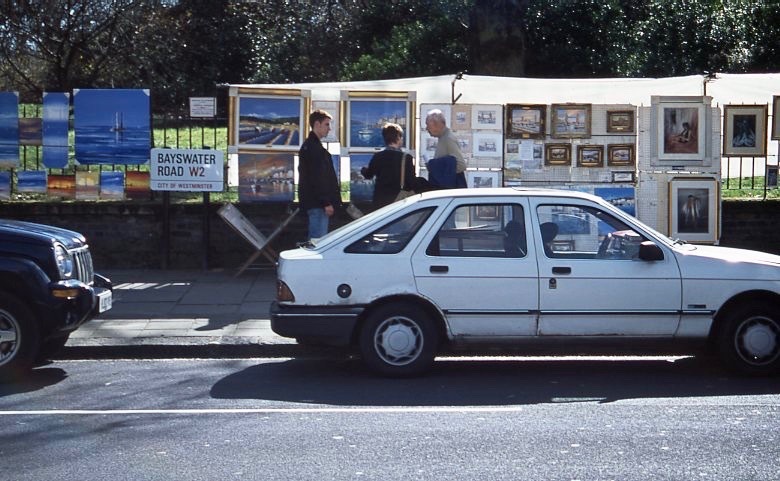 This entry was posted in Uncategorized and tagged Bayswater Road, blue plaque to J.M. Barrie, J.M. Barrie, Peter Pan statue, Sir George Frampton by derrickjknight. Bookmark the permalink. Wow very cool! Lovely picture of you smiling! Great grin Derrick. Wonderful seeing you. That’s a great grin! I think Jackie’s version of Spanish Omelette sounds much more tasty than the real thing. I sometimes make a similar thing but just call it an omelette. Clearly I must up my game!! I remember going to see that with my dad. Thanks for the memory nudge. Love the grin! Lovely family memories in your photos. I saw this 44 years ago when my son was 8 months old. 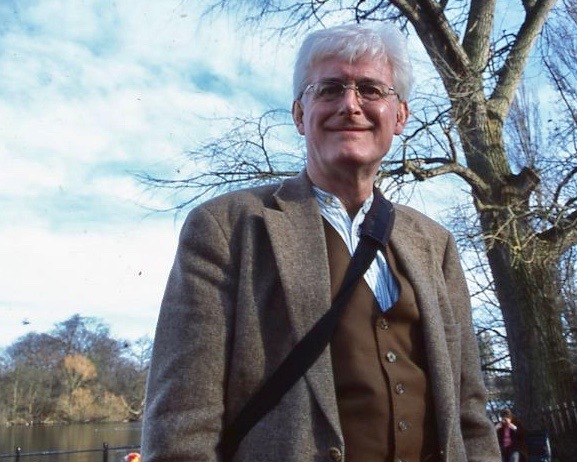 It has been a consistent part of my memory of London. I also remember the fenced in playground somewhere nearby – tall wrought iron fence with a most English sign at the gate. “Adults not admitted unless accompanied by a child.” I think I got it correctly – I wonder if it is still there. One, I remember going to see the statue when I was about that age, so this was a nostalgic moment. Thank you for that. Two, Jackie’s omlette is clearly superior to the wishy-washy Spanish version. Perhaps the Government could send the two of you on a trip to teach them the recipe..
Three, is that the same shirt you have been spotted wearing in recent photographs? 1. So pleased to trigger the memory. 2. This might be an idea. 3. Similar, but not the same make. I certainly owned the current two then -they are about 25 years old. I love this post! I watched two movies recently about A. A. Milne and I found out that he, Sir Arthur Conan Doyle, Sir J. M. Barrie, and George Llewelyn Davies were on a cricket team together. 🙂 Isn’t that so wonderful!? What a great photo of you, Derrick. You’re looking the slightest bit devious. 🙂 I loved the photos of everyone around the statue. A spicy Spanish omelette sounds delish! Nice photo of your Derrick! Sounds a very nice omelette! 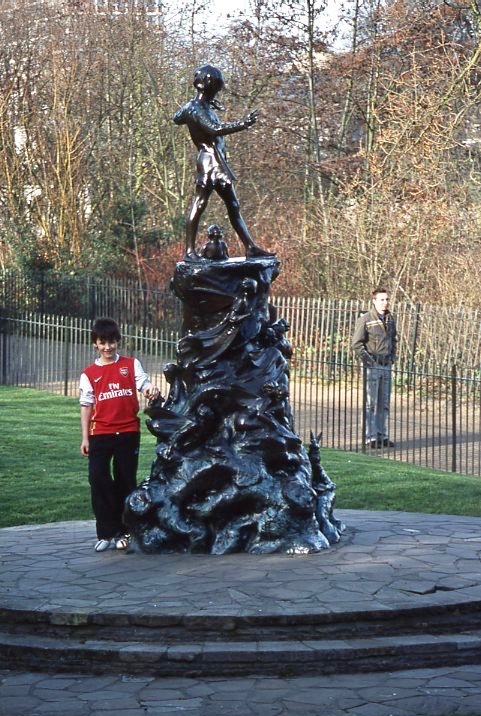 I used to play on that Peter Pan statue. Lovely to see it again. 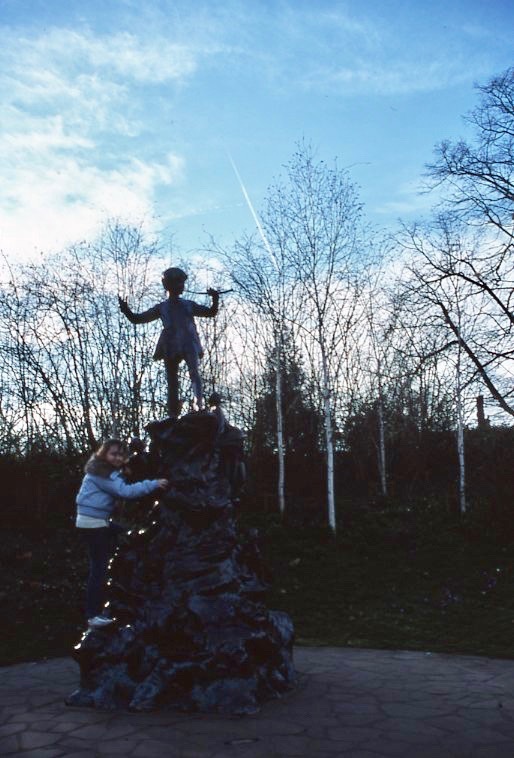 In Central Park there is a lovely Alice in Wonderland statue https://www.centralpark.com/things-to-do/attractions/alice-in-wonderland/ . where I show how I used Tenniel’s Cheshire Cat in a Listener Crossword. Love the Cheshire cat post. Extremely clever crossword. Wonderful picture of you and the kids. When I was young, Peter Pan was one of my favorite books. In a way, it’s a rather odd story, but that might be why I liked it so much and read it over and over. Your grin says it all. What a wonderful neighbor you’d be. Wish you lived next door, Derrick… I’d come knocking to taste those omelettes! Lovely photos and great smile, Derrick. Jackie’s omelet gets my vote. As always your photos make me think what a magical place you live! Ah, so that’s how you looked then! The grin has remained, though, and it’s delightful! 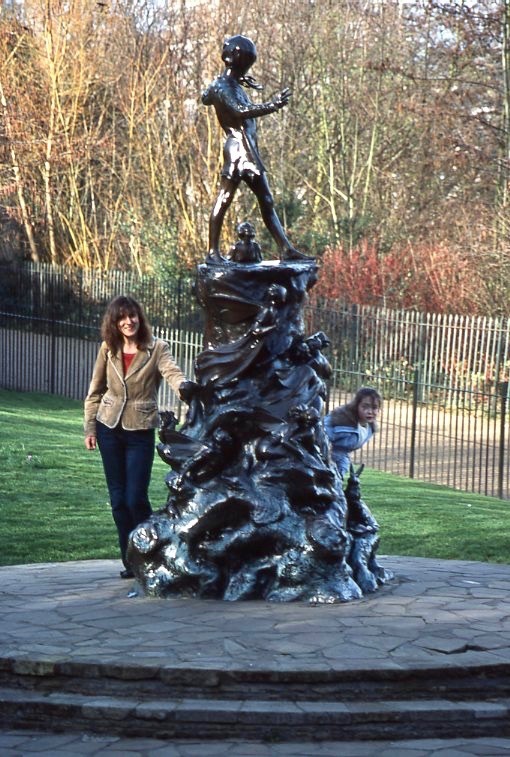 Really lovely photos taken in Kensington Gardens with good memories to go with them. Derrick sans whiskers, an improvement? Not really; I prefer the bewhiskered one!